Samsung is surely up to something as a new variant of the Galaxy S9 has reportedly surfaced on Chinese certification website TENNA. The alleged Samsung device sports the code-name SM-G8750. And this code name is similar to Galaxy S9 “mini” with mid-range specs earlier spotted on Geekbench site. Interestingly, the images of the handset listed on the website show rear camera design similar to that of Apple iPhone X. 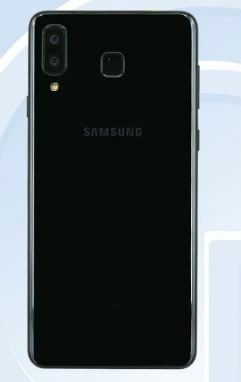 As per the images on the website, the alleged S9 variant has its vertical camera set-up pushed to the right side, similar to the way it is in iPhone X. The current version of Samsung Galaxy S9 Plus features dual camera set-up at the back with two 12MP sensors. However, the placement is in the middle (just above the fingerprint sensor). The upcoming smartphone variant is also said to come sans heart rate monitor at its regular spot as per the leaked images. Reports also suggest that the smartphone may be called Samsung Galaxy S9 Mini. As for the specifications of the alleged Galaxy S9 variant, most of these appear to be same as those in the present version of Galaxy S9 Plus. The listing reveals that the upcoming Galaxy smartphone will sport 5.8-inch AMOLED display of 2960×1440p resolution and backed by a 3,000mAh battery. Powered by a 2.8Ghz octa-core (processor unspecified), it will be paired with a 4GB or 6GB of RAM. The resolution of the camera of the device listed on Tenna isn’t very specific as it states that the primary camera setup is “8 million pixels or more (12 million pixels)”, with 8 million pixels or more as the secondary camera. As per the listing, the Samsung SM-G8850 will come in Black and Blue color options.